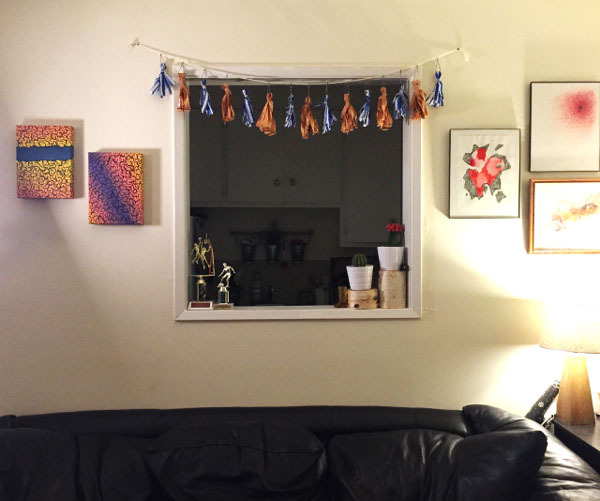 Recently, while browsing a home goods website, I came across a garland made of adorable little vintage fabric tassels and pretty string. Of course, the easy-to-make and not entirely hard to conceptualize art piece came with a high price tag. Time to get to work. Start by deciding how long you want your tassels to be, and how thick. This will dictate the size of the piece of fabric you cut. 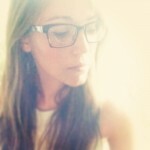 I went for something a little more light and airy, but still substantially long. 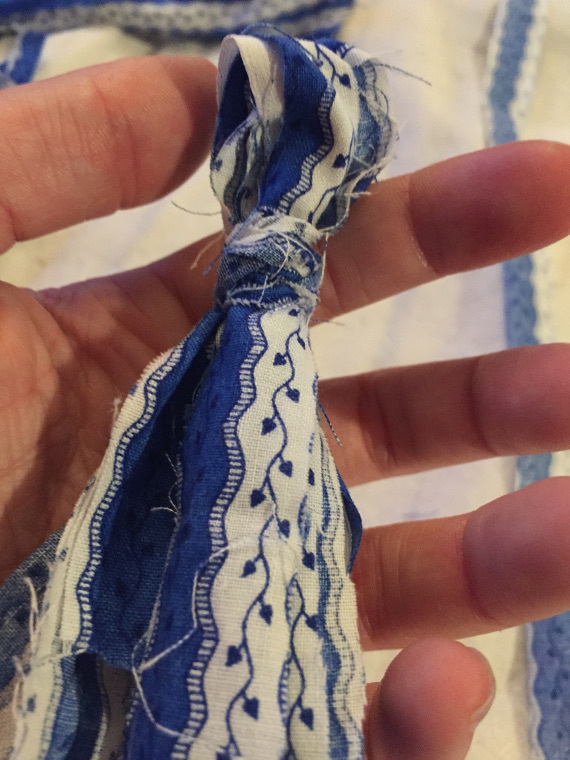 You will want to make sure the width of your piece of fabric is double the length of your tassel, since you will be folding the fabric in half. 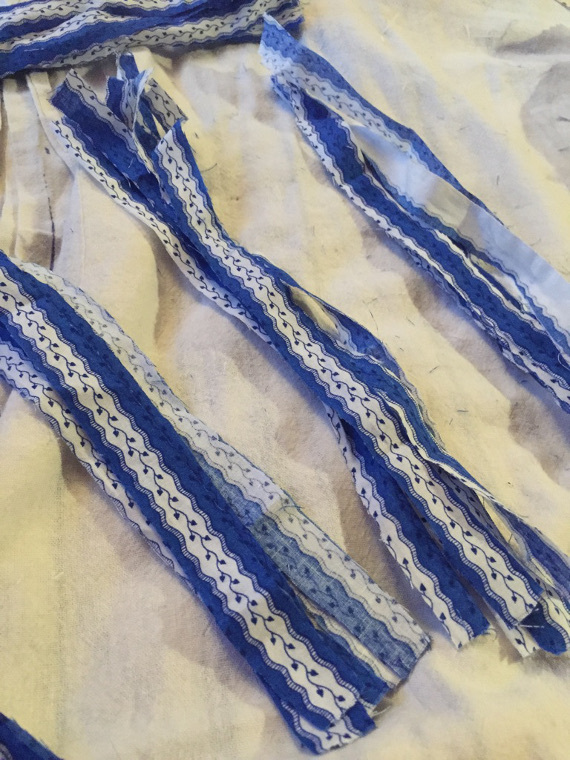 Cut your fabric into smaller, more workable pieces. 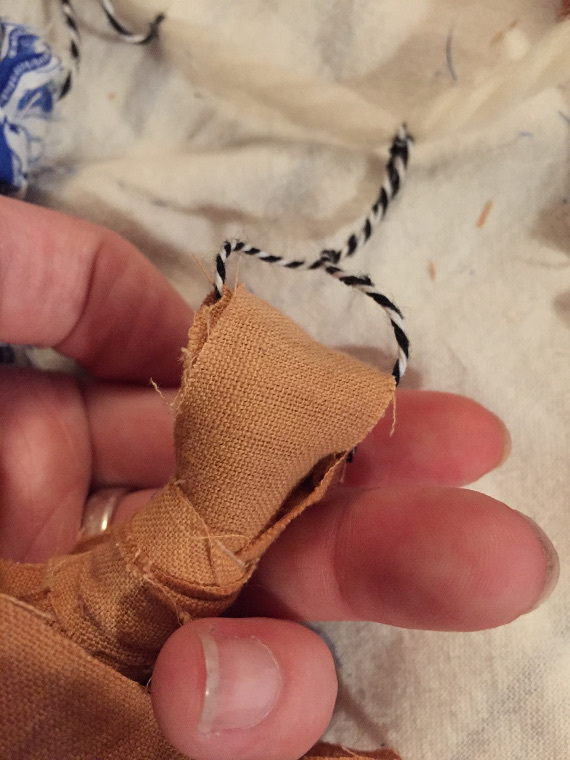 I did this easily by folding the fabric and cutting along the seams. Next, decide how wide you want each individual piece of the tassel to be. Once again, to get consistently sized pieces and to make the cutting quicker and easier, I folded my fabric to the correct size and cut along the seams. 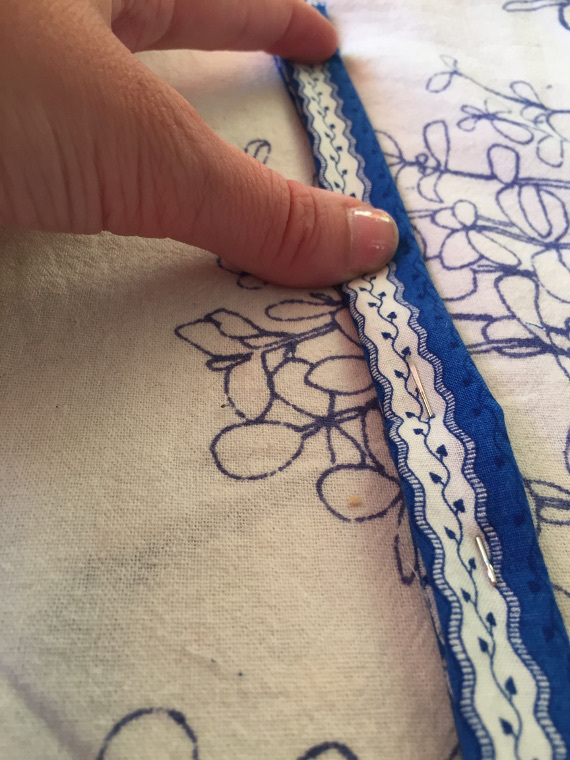 You can use a needle or pin of some sort to fold the fabric in place while you cut it, if you like. I tried multiple different methods of cutting while making this craft, and although this one took some patience and creative anchoring (I put the end of the strip of fabric between my knees and pulled it taught with one hand while cutting with the other), it was by the far the quickest and easiest way to get the strips to be the same size. I ended up ditching the white fabric in the middle; it was too stiff and didn’t really suit the project well. Next, figure out how thick you want your tassels to be. 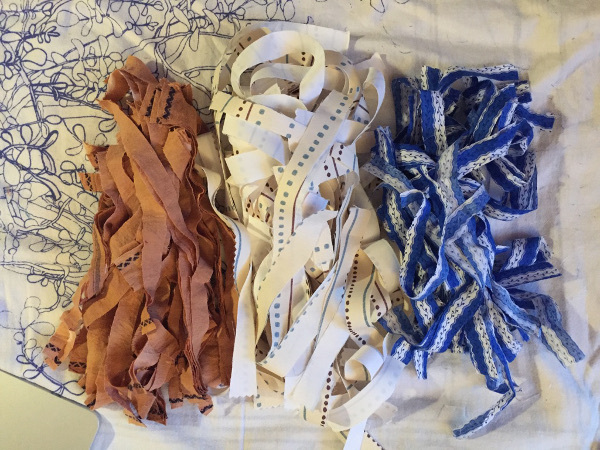 Once you know, create as many piles and you’d like tassels with the same number of strips in each one. Leave enough scraps that you can tie one piece around each tassel. Now take each pile and fold it in half. 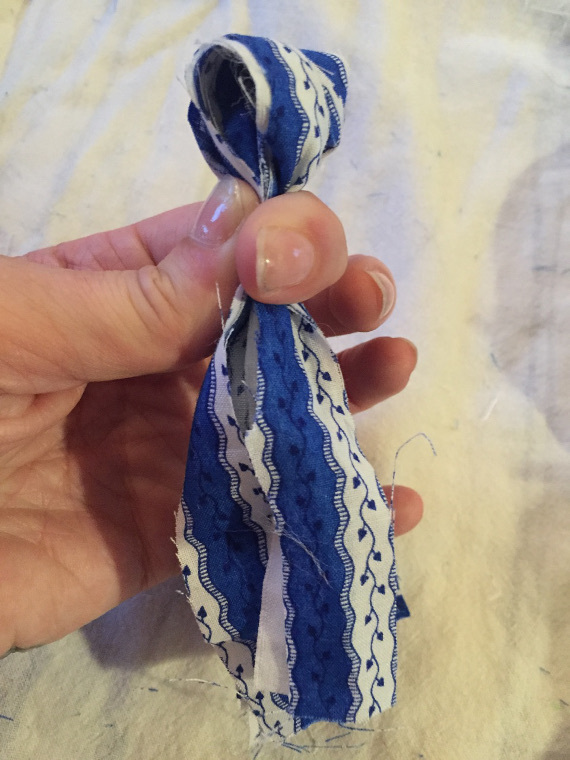 Wrap a scrap of the same pattern of fabric around the tassel, close-ish to the top, but leaving enough room that you will be able to thread a piece of string through the loops you are creating. Just go ahead and tie it off. It’s okay if you’ve got a couple shorter little pieces sticking out from this, we’re going for the messy look! Your first tassel is complete! Repeat these steps until you have as many tassels as you would like. 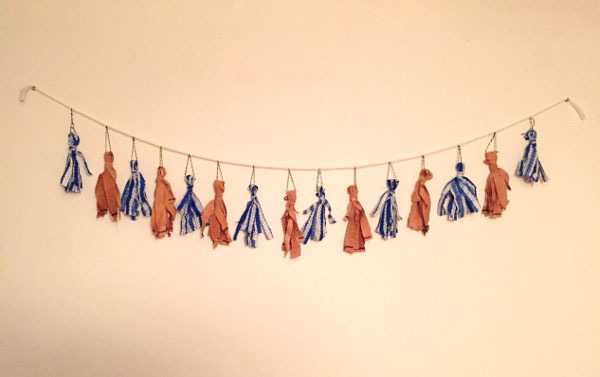 Find a piece of string you can use as the garland portion of your tassel project. 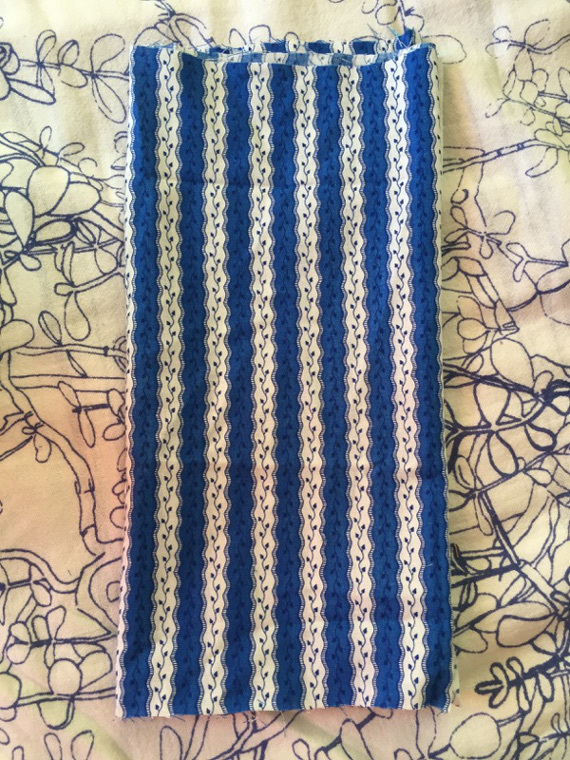 I suggest something a little more sturdy for this (I used thick yarn), but you can use whatever you want. 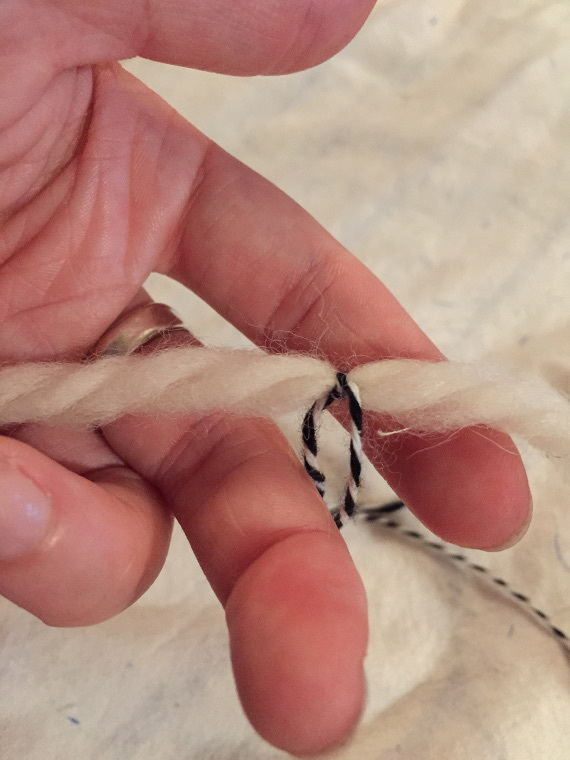 Cut a longish piece of string and double knot it tightly to your garland, so that the tassel won’t slide around when you attach it. Thread one end of the string through the tassel loops, then tie it to the other end of the string, leaving enough room for the tassel to dangle, and making the knot as close to the center as possible, so it will be hidden inside the loops. Repeat this until all your tassels are tied on, and ta-da! You are finished. 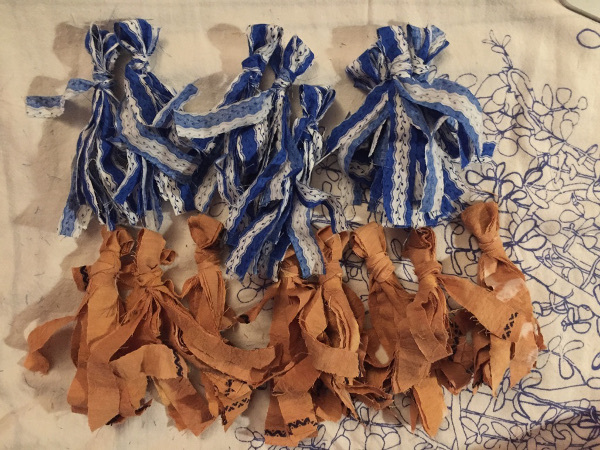 This entry was posted in Bunting & Garlands, Crafts, Home Decor, Parties, Recycled Crafts and tagged Baker's Twine, Scrap Fabric, Tassels on July 19, 2015 by Alyssa.